Uptown Valet and Transportation was honored to provide our valet services for the recent State Dinner Gala at the LBJ Presidential Library and Museum, held on December 1st. Check out the write-up on it from the official site here. We parked 120+ cars that night and were busy throughout the evening, thus starting out December with one of our largest events of the month. The Library was celebrating their grand reopening complete with a newly renovated main exhibit which was on display for attendees and opened to the public on December 22nd. The LBj Library is Located on the University of Texas campus, and is definitely something everyone here in Austin as well as visitors from out-of-town should make a trip to in 2013. If you'd like to use our valet services at your upcoming event, please contact us today or fill out a request form below. 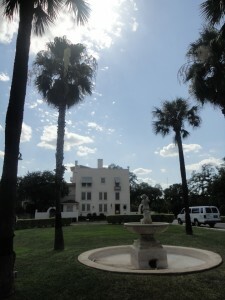 Mercury Hall is a lovely venue in south Austin that succeeds in offering seclusion in a busy part of town. Complete with 100+ year old church brought in from a small town, Mercury Hall has serene ambiance in a convenient location. It's a venue where we've worked multiple times and where our years of experience help us do our job as excellently as possible. I had planned on writing a venue overview of Mercury Hall complete with some excellent (eh, mediocre) cell phone photos, but the event proved to be one of our busiest of the season and so I've decided to write on that instead. In short, we were told that there'd be around 100 guests attending the party, but we wound up parking around 120 cars. This meant that we had about half of the valets that would have been optimal for that amount of cars. We were kept busy utilizing all the space available to us to keep cars moving as our valets got them parked. The available parking at Mercury Hall filled up rapidly, a gravel lot nearby also filled up and we parked a lot of cars on nearby streets. There wasn't too much room for relaxation, as guests started trickling out shortly after all the cars were parked. Fortunately though, there was time enough to call in some extra valets to ensure that guests weren't left waiting too long for their cars. After that initial rush of visitors, some help was called in to ensure that everything would run as smoothly as possible when guests left. We don't often have events where we receive far more cars than we expected, but in this case we handled the increased traffic as well as possible to ensure that guests and planners were happy with our service. If you'd like to use Uptown Valet for your next event, request a quote or contact us today. Uptown Valet provided valet services for Ferrari of Austin recently. A smaller event on a gorgeous evening, cars were parked in a lot behind the venue, on a nearby building's lot where we had gained permission, and some were parked on a nearby street. We kept the Ferraris out front though; nearby for their owners and creating quite the nice display outside the dealer. It was a smaller event on a gorgeous evening. It was a good, well-run event and were happy to be able to help Ferrari of Austin's night run smoothly. Up next this week is ACL weekend. We've got valet events throughout the day Thursday and plenty on the weekend along with lots of chauffeur events as well. Please contact us if you'd like more information. Uptown Valet worked this Fourth of July at the Austin Country Club. Fireworks were free to fly this year as the burn ban wasn't as strict as last year. 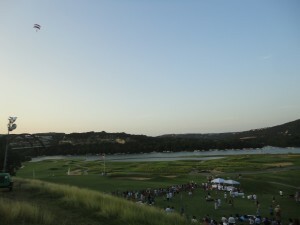 Uptown Valet helped manage parking, as Austin Country club was expecting over 1,000 guests for their fireworks show. Our task was to maximize parking efficiency for the guests and to report when various sections were filled to capacity so that guests wouldn't go towards sections of parking which had been filled up. A lot of cars parked in the parking lots, but when a few started parking outside the parking lot on Long Champ drive without having checked into club parking first man soon followed and we were never quite filled to capacity. We filled up most of the lots though and what guests did show up late in hopes for a spot were happy when we could point them to the few spots still available. In addition, we drove shuttles for guests coming from Long Champ when that area proved to be busier than expected. After the fireworks went off we also assisted in shuttling some guests and in managing cars exiting the lot. We kept the flow of cars going as best we could and created space for carts or cars getting out of a parallel spot when needed. The line of cars itself extended up Long Champ to a stop sign; after determining the length of the holdup, one of us was posted up top to wave them through the stop sign - this eased traffic considerably.